Most people think, to relax and unwind, one need’s to book a vacation. Sometimes a vacation is closer to home than it seems. You don’t need a plane ticket, a fancy hotel or even a new town to take a vacation. All you need is a slight change of scenery, a slight change of pace and some peace of mind. For these homeowners vacation happens every time they step outside their houses, thanks to these outdoor escapes in their own backyards. Whether its a greenhouse-turned-studio, a playground-turned-pavilion or a grain-shed-turned-getaway, each of these beautiful backyard escapes has everything it needs for plenty of relaxation and enjoyment. 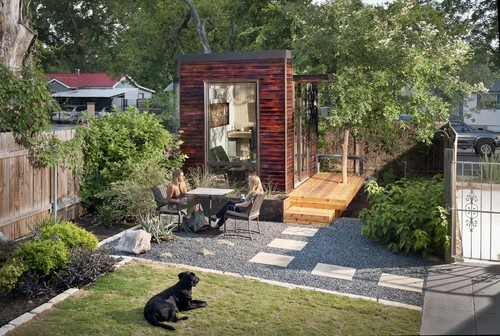 This fantastic home office was designed and built offsite, shipped in parts and assembled in five days. 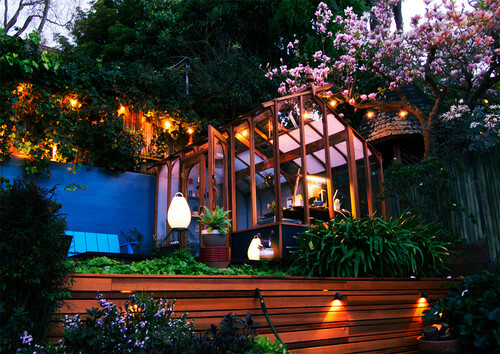 The entire process took six weeks and resulted in a stunning 96-square-foot backyard space. The designer charred the sides in shou-sugi-ban style for its interesting look, but the exterior finish process also makes the structure resistant to fire, rot and pests. Engineered wood floors, Ikea storage and opaque glass treatments give the reinvented greenhouse e a surprisingly homey feel. Different people enjoy different things, so we have even the most extreme backyards. Everything is possible when it come down to making your backyard a vacation spot. Do you have a backyard vacation? Upload a picture and tell us about it in the Comments section — it could end up in another feature of our Blog.